We’re often asked how to lead meditations. Whether you’re a therapist who wants to incorporate mindfulness practice with clients or a yoga teacher who wants to lead a meditation for students, knowing how to lead a guided meditation can be of great use to you and your community. Our new webinar is open to all who wish to guide others through meditation. 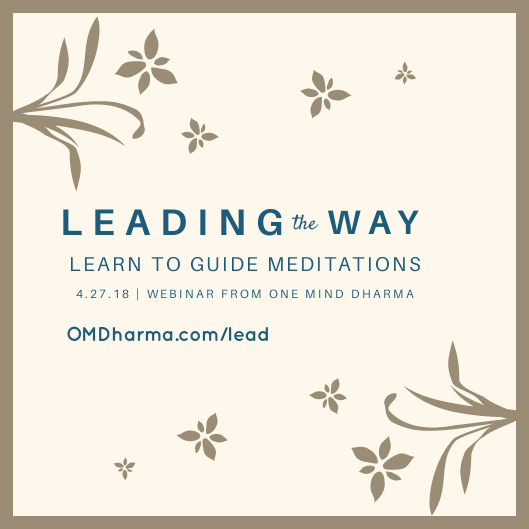 Leading the Way is an upcoming webinar offering insight into leading meditations for individuals and groups. Designed to simply offer some instruction and techniques for leading meditation, this webinar is open to all who wish to learn to lead a guided meditation. The webinar will take place Friday, April 27th at 10:00am. If you cannot make the live presentation, you can be sent a full recording after. This two hour webinar will give you an understanding of how to lead a meditation, and offer you time to ask questions. Matthew Sockolov is the founding meditation teacher of One Mind Dharma, a meditation center in Petaluma, California. 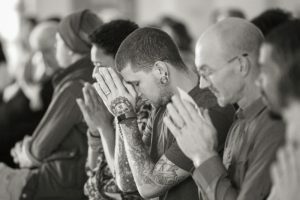 Graduating from the CDL training program at Spirit Rock Meditation Center, Matthew has led meditations at addiction treatment centers, yoga studios, online, and elswehere for years. He has worked extensively with at-risk youth, recovering addicts, and all who walk through the doors of One Mind Dharma. Matthew’s meditations can be found on YouTube, the Google Play Store, iTunes, Spotify, InsightTimer, and various websites across the Internet. He records meditations daily for One Mind Dharma’s Daily Meditation Emails, and records the Guided Meditation Podcast weekly. He has experience leading meditations in both Buddhist and secular settings. One Mind Dharma’s collection of guided meditation scripts has 50 written guided meditations you can use to help lead groups. The collection comes in downloadable form, so you can use from a device or choose to print into a binder. Taking the role of leader when guiding meditations means showing up for those around you. Guiding a meditation properly can help somebody gain insight, compassion, and ease. Learning to teach meditation involves bringing mindfulness to the practice of teaching. We learn to tune into the needs of those meditating, offer guidance in the most useful way possible, and be true to our own experience. The webinar is meant to offer an introduction with basic training in leading a meditation for an individual or a group. We will discuss what it means to lead a meditation for a group, how our own practice and wisdom comes into play, and how to work with those new to practice. If you have a dedicated practice and a desire to teach, we encourage you to seek out a meditation teacher to work with one-on-one. First, an individual needs to develop a personal meditation practice. One must develop insight, understanding of the path, and compassion before diving straight into working with others. Those interested in teaching generally need a teacher to work with. Find a teacher you can relate to or learn from, perhaps one who has been through some formal training program. Go through a facilitator training program, introductory teacher training program, or online training program. These are meant to teach people to facilitate meditation groups and lead guided meditations. Begin leading groups and investigating the practice of teaching. Experience is one of the best teachers! Go through a formal teacher training program. Many of these require a nomination from a guiding teacher, and require years of dedicated practice and experience. A meditation teacher can help you with your practice, discuss with you the role of teaching, and help look for recommended trainings. If you are looking for a teacher, Matthew is available. You can email him any time at Matthew@OneMindDharma.com.